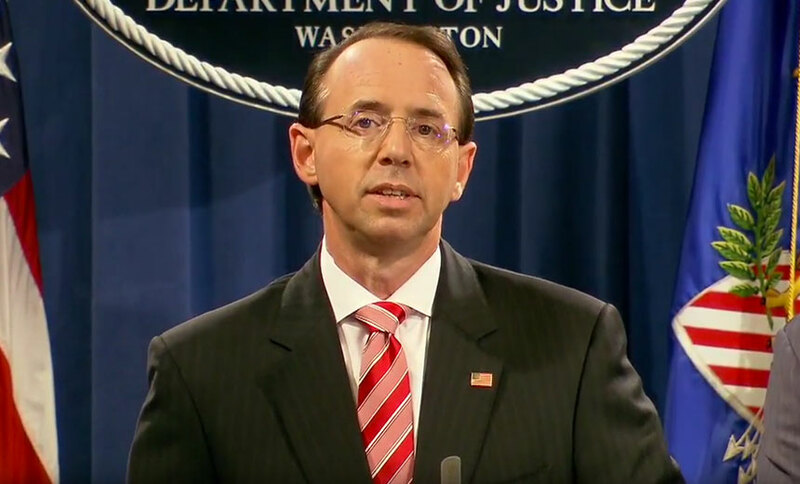 Deputy Attorney General Rod Rosenstein announces indictments. Twelve Russian intelligence officers have been indicted, as a result of Special Counsel Robert Mueller’s ongoing investigation, for allegedly conspiring to interfere with the 2016 presidential election, including by hacking the Democratic National Committee. In a similar move back in February, 13 Russian nationals and three Russian companies were indicted on charges related to election interference (see US Indicts 13 Russians for Election Interference). Deputy Attorney General Rod Rosenstein announced the grand jury indictments Friday, just days before President Donald Trump was scheduled to meet with Russian President Vladimir Putin. While speaking at a press conference with British Prime Minister Theresa May Friday morning, President Trump, who had earlier been briefed about the soon-to-be-announced indictments, described the Russian investigation as a “witch hunt,” saying it was “rigged” and that it “really hurts our country, and it really hurts our relationship with Russia,” CNN reports. Top Democrats in Congress on Friday called for President Trump to cancel his Monday summit with Putin after the Justice Department announced the indictments, CNN reports. “President Trump should cancel his meeting with Vladimir Putin until Russia takes demonstrable and transparent steps to prove that they won’t interfere in future elections. Glad-handing with Vladimir Putin on the heels of these indictments would be an insult to our democracy,” Senate Minority Leader Chuck Schumer said in a statement. But White House press secretary Sarah Sanders said Friday the summit will not be canceled. Deputy White House press secretary Lindsey Walters said there is no evidence tying the Trump campaign to hacking attempts, CNN reports. The indictment includes 11 criminal charges. “Eleven of the defendants are charged with conspiring to hack into computers, steal documents and release documents in an effort to interfere with the election,” Rosenstein said in his statement revealing the indictments. The defendants worked for two units of the Main Intelligence Directorate of the Russian General Staff, known as the GRU, according to the indictment. “The units engaged in active cyber operations to interfere in the 2016 presidential election. One GRU unit worked to steal information, while another unit worked to disseminate stolen information,” Rosenstein said. In addition to releasing documents directly to the public, the defendants transferred stolen documents to another organization, not named in the indictment, and discussed timing the release of the documents in an attempt to enhance the impact on the election, Rosenstein said. In an effort to conceal their connections to Russia, the defendants used a network of computers located around the world, and paid for it using cryptocurrency, according to the indictment. In a second, related conspiracy, Russian GRU officers hacked the website of a state election board and stole information about 500,000 voters, Rosenstein said. They also hacked into computers of a company that supplied software used to verify voter registration information, targeted state and local offices responsible for administering the elections, and sent spear phishing emails to people involved in administering elections, with malware attached, he said. AI may build Red Redemption 2 open world on the fly.